You know what? It feels pretty good. Scott played Clark Griswald and hung our lights outside. We set out a few of our favorites. 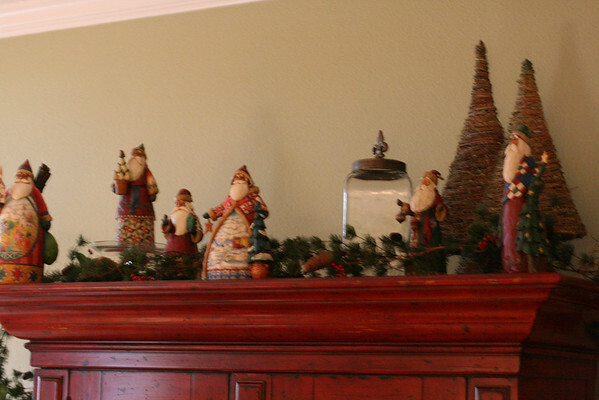 My Santa collection sits on our armoire, the snowmen gang is on our mantel. or Rudolph and all of his friends. So far though, that's it. No lighted garland on the stairs, no decorated trees scattered thematically throughout the house. I've had mixed feelings about not doing our trees, especially the main, real tree. We usually get a Frasier Fir that makes our house smell so festive and winter-y. I do miss that. 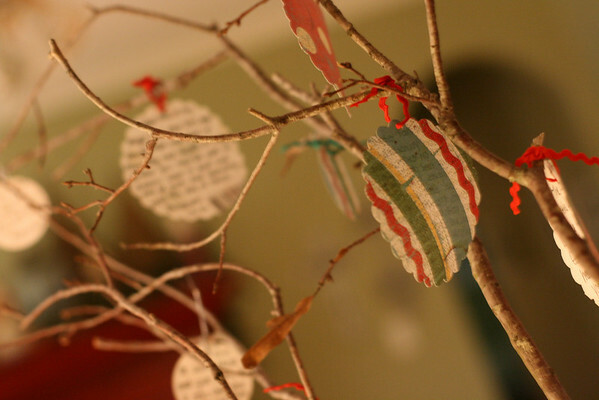 Annelise recently helped me with a special project: a scripture & blessing tree. I never quite got myself together enough to do a gratitude tree for the Thanksgiving holidays, but I managed to carry over the idea for Christmas. Annelise collected pine cones and helped me punch the ornaments, then I wrote some scriptures on the back of the ornaments. Our plan is to add more scriptures and record our blessings this holiday season. The stark simplicity of this branch makes me happy. *In case you are wondering why we scaled down on all the hall decking this year, well...in approximately 48 hours we have an appointment with a certain mouse and all of his copyrighted friends. I predict definite holiday sensory overload. We do plan to decorate a small, real tree when we return next week. 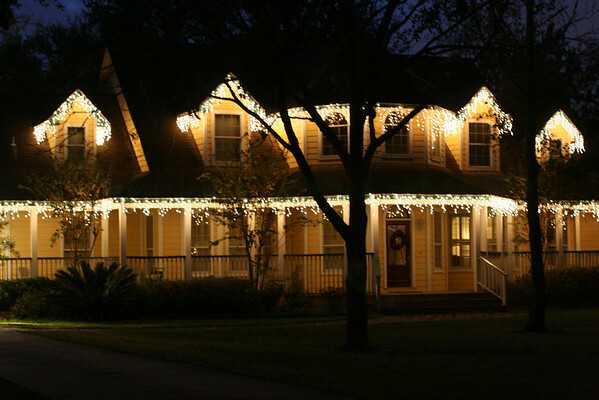 Your outside lights look beautiful. I wish I could blame my lack of decorating on a certain mouse, but I just can't get in the spirit this year. Of course the Little People Nativity has been out for a week and already there have been fights over the Baby Jesus. Really who fights over the Baby Jesus -- besides my kids?!? Love your style and your house is simply beautiful! I hope you have a wonderful time with the Mouse and his copyrighted friends (LOL). This has been a fun year of travel for you! I love your decorations and that giving tree is really a neat! Have a great time Holly! I think your home looks beautiful! I am right there with ya in regards to simplicity...it is always the little things we remember! I need to tuck away the scripture tree idea for next year! Have a wonderful time at your "appointment!" I love your simple tree and the thoughts behind it. your blessings tree is really wonderful. oooh! a has got to be excited! 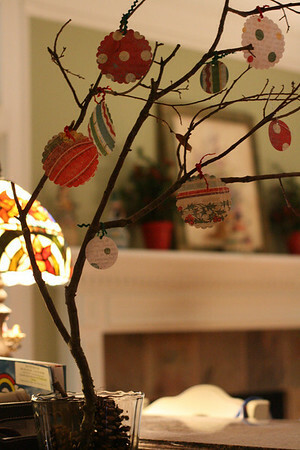 what beautiful decorations- i love the scripture tree idea. I love the icicle lights on your house. It looks beautiful... Have fun on your vacation. I am sure your daughter is going to have a blast. Merry Christmas. Your house is gorgeous! 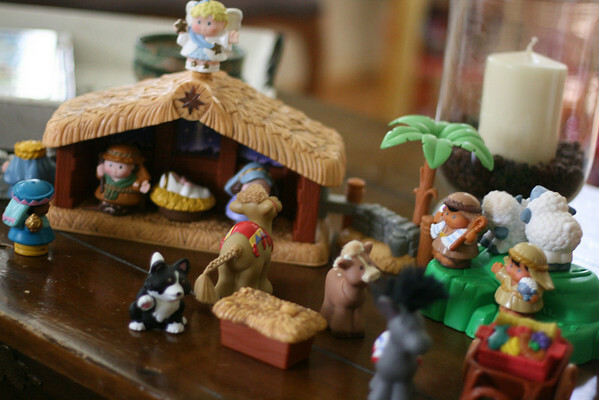 We have the Little People nativity too and it's one of my favorites to pull out in December. Your house looks beautiful! Everything looks so lovely and festive. 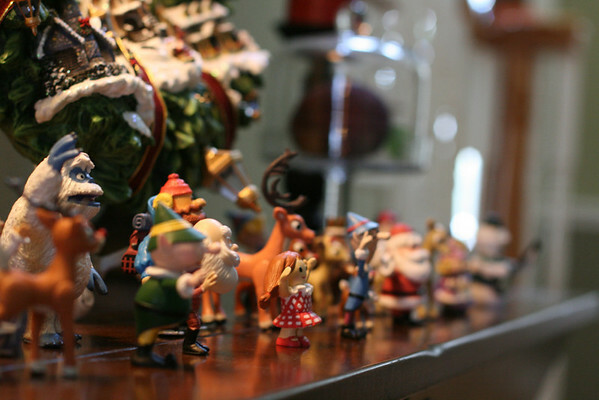 Where did you get those Rudolph and friends figurines? Everything looks great - and had a wonderful time with THE MOUSE! Your house looks beautiful. I love the simple branch too. Thanks everyone! The simple approach was actually freeing--less to put away later too. Of course, we haven't really bought presents yet or done Christmas/Holiday/New Year--okay Valentine's Day cards--yet. Jill: I think Scott bought the Rudolph sets at Suncoast Video a few years ago. He usually takes them to work to decorate his cubicle. I know. Oh my gosh, that's scaled down?! I LOVE the outside. SO gorgeous!! I get no such help from my hubby. L-O-V-E the blessings tree and that A was so involved. Have fun with the mouse. Can you believe that you'll be missing SNOW here?!??!??! Love you! Your house is so beautiful and welcoming! I love that porch. And I love your scripture/blessing tree. Simply wonderful. Have fun with the mouse! Stunning, Holly! If that's simple, I'm simply impressed!! Hope your trip is a blast. I bet my hubs mom would love that scripture tree! Christmas lights are so fun..not fun to put up or take down, but I adore them.